TAIL ; First tie in a piece of Orange wool along the shank of the hook and cut it off placing your scissors against the bend of the hook. Make the length of the Marabou tail twice the length of the hook shank. 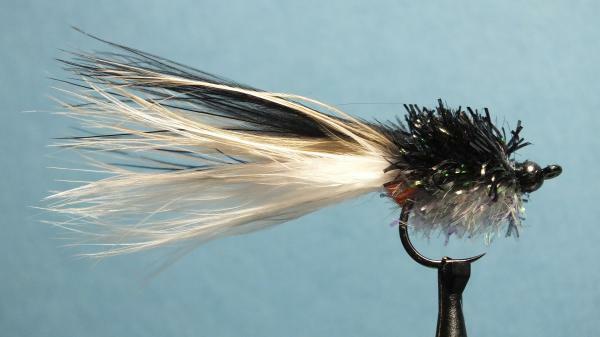 Use Hareline X-Select Marabou white on the underside/bottom with two strands of blue flash tied on top. Then tie in Hareline X-Select Tan Marabou with two more strands of blue flash tied in above the Tan Marabou. On top tie in Hareline Black X-Select Marabou. BODY ; Hareline X-Large Cactus Hackle Pearl XCH for the large tadpole, Hareline Cactus Chenille Large Pearl CCL 284 for the Medium tadpole and Hareline Cactus Chenille Medium Pearl CCM284 for the small tadpole. Tie the full length of the hook with Cactus chenille and tie off against the bead. BEAD ; 4,0mm Black Nickel bead for the large tadpole, 3,2mm Black Nickel bead for the medium tadpole and 2,8mm Black Nickel bead for the small tadpole. COLOURING; Take a Black permanent marker and colour only the top half of the Chenille Black, leaving the under belly the white colour of the pearl Cactus chenille. NOTES: For the large tadpole you might want to trim the Cactus hackle to expose the hook so that the Cactus hackle sits inside the gape of the hook. When tying the large tadpole tie the Cactus hackle about a bead width short of the bead. Then tie in a thinly cut black Zonker strip and do two wraps of black Zonker to fit in snuggly behind the bead. Tie the black Zonker off and the cut the bottom half (only), of the black Zonker level with the Cactus hackle on the underside of the fly, leaving the black Zonker long and flowing on the top half of the fly. Retrieving the fly: Tadpoles don’t move very fast but bobble up and down or along the bottom by wriggling their tail. Do a long retrieve but as you are doing this bounce your trigger finger simultaneously as you strip, this creates the bobbling/wriggling movement just like the tadpole. If you do it slowly the fly moves slowly along the bottom. If you retrieve quicker the fly will lift, move upwards with the marabou tail titillating, then pause for two seconds allowing the weight of the bead to make the fly descend and the marabou tail will titillate on the way down, imitating the movement of the tadpole as it falls to the bottom. Where to fish the fly: Fish the fly where you can see tadpoles moving, this is usually in shallower water, gradual sloping banks of mud or clay or next to weed beds. Notes: If you strip the fly very fast the fly is often mistaken for a minnow. 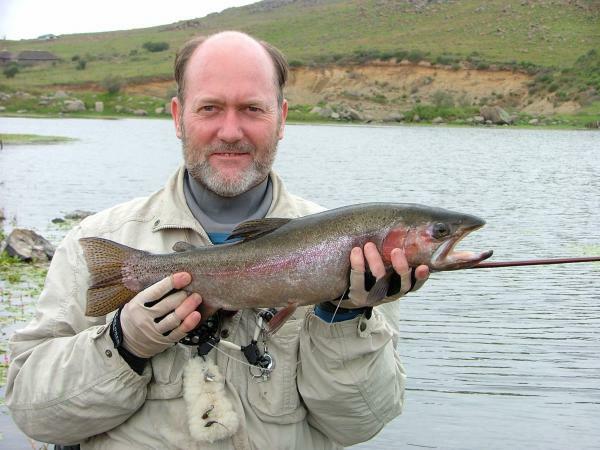 Interestingly this pattern has found its way all around the globe and has fooled Brown Trout in New Zealand, Trout in Australia, the United Kingdom and the U.S.A including native cut throats and has caught sea Trout in Denmark, Pike in British Columbia as well as Steelhead and salmon.